Early in the docudrama Truth, writer-director James Vanderbilt does a newsroom spin on the classic caper picture’s “assembling the team” scene. He’s already introduced Mary Mapes (Cate Blanchett), a veteran broadcast news producer dedicated to chasing tough stories. One by one, the movie adds Mapes’ trusty trio of sidekicks: resourceful researcher and political radical Mike Smith (Topher Grace), retired colonel and military liaison Roger Charles (Dennis Quaid), and associate producer Lucy Scott (Elisabeth Moss), whose main job is to ask questions like “What do you mean?” and “Why is that?” so that the other three can deliver exposition and opinion. That’s the nature of Truth: a promising build-up, dead-ending into prosaic pontification. The story this group breaks—on the prestigious, award-winning CBS news magazine 60 Minutes, no less—involves President George W. Bush’s service in the National Guard during the Vietnam War, asking whether he first pulled strings to avoid the draft and then failed even to meet the basic requirements of his posting. Truth is mostly set in 2004, in the months leading up to Bush’s re-election, and if nothing else, it’s a reminder of how high the stakes were back then, and how uncertain the outcome. With public sentiment starting to turn against the Iraq War, and Democratic challenger John Kerry up in the polls, the group “Swift Boat Veterans For Truth” attacked Kerry’s war record—previously considered a political asset—which to Mapes and 60 Minutes made the president’s own military past fair game. On September 8, 2004, the program’s Wednesday edition aired a report on memos appearing to show that Bush had shirked his sworn duty as a Guardsman. But by the next day, the internet was abuzz with right-wing bloggers and amateur sleuths offering evidence that the documents were fakes. Truth’s contention—drawn in part from Mapes’ own memoir Truth And Duty: The Press, The President, And The Privilege Of Power—is that no one has ever convincingly disproved the memos’ authenticity. But the movie’s larger point is that even if Mapes’ team was duped by their source, the substance of the documents had already been corroborated. Moreover, Truth notes that CBS’ broadcast and cable news rivals devoted an uncommon amount of airtime and resources to reporting on 60 Minutes’ downfall, rather than following up on Bush’s time in the Guard. 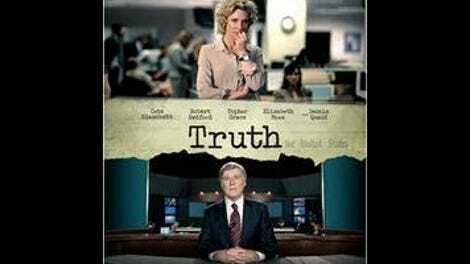 The film is fundamentally about the dangerous downfall of old media institutions, and how calculated political attacks and the prioritizing of profits by media conglomerates can lead to a world where the powerful no longer feel obliged to answer questions from a journalist as accomplished and well-known as CBS anchor Dan Rather. Truth also brings some critical perspective to what went wrong within CBS, not letting 60 Minutes off the hook entirely for squirrelly sourcing. In the movie, Mapes keeps having to make compromises: forced to run the story earlier than she’d like because the network was trying to avoid accusations that they were springing an “October surprise” on Bush, and then pushed to trim a key contextual interview because it was too long and too “boring.” When Truth really gets cooking, it has some of the insider snap of Broadcast News, showing the mad rush as a piece comes together, and how tight deadlines can lead to major mistakes. It’s not just Blanchett who carries the burden of underlining Truth’s message. Grace can be effective in the right role, but Vanderbilt does him no favors by having Smith be the guy who stands up to the CBS brass to tell them what they’re doing wrong—complete with detailed statistics, which Grace is meant to produce as though he were delivering a spontaneous rant. Again, what the character and the movie has to say is important, and as a behind-the-scenes look at one of the major newsroom crises of the past 15 years, Truth is fascinating and often exciting. But the film lacks the qualities of great drama that make it feel like it’s unfolding right in front of the audience. Instead it has well-known actors in costumes, reciting talking points. No one can complain that Truth buries the lede. It’s all lede.